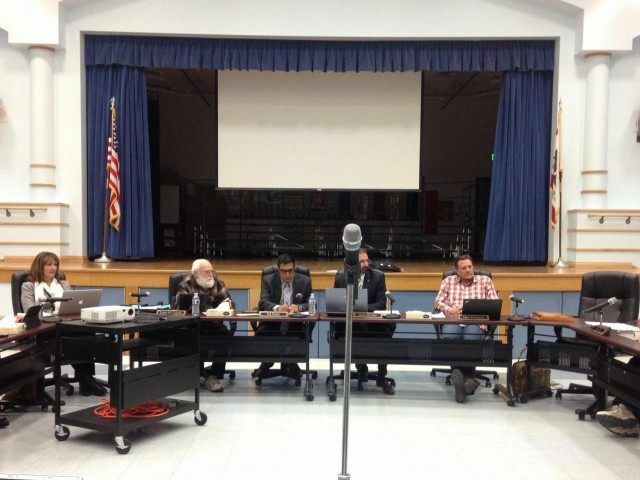 ACTON — Members of the Acton-Agua Dulce school board voted unanimously (5-0) Thursday evening to allow students to choose to draw Muhammad–or not–in one of America’s smaller school districts. The mother of a 7th grade student at High Desert School in Acton had complained when her 12-year-old son brought home a worksheet from his history class two weeks ago titled “Vocabulary Pictures: The Rise of Islam.” The worksheet listed words such as Quran, Mecca, Bedouins and Muhammad, and asked for students to draw images related to the words. She then complained that the assignment, which turns out to be part of the approved curriculum, was inappropriate and suggested it taught children “how to insult a religious group.” The Los Angeles Daily News reported that district superintendent Dr. Brent Woodard told staff permanently to prohibit the drawing of all religious figures in order to prevent the offending of all religious groups. During Thursday night’s town hall meeting, Woodard disputed the Daily News story. Matt Ridenour, who serves on the school board, said he wanted to make sure the press corrected the record, noting that the school was proud of a curriculum that seeks to educate its children about the diversity that exists in the United States, which is composed of people hailing from various religious and ethnic backgrounds. “This issue grew from a very innocent practice on the part of a district and a teacher following state-mandated 7th grade curriculum instructions,” Mark Distaso said. He said the assignment came out of a book that was adopted by the school district called Midieval and Modern Times, and noted that the assignment stemmed from a standard teaching mechanism, which has found that students learn better by drawing pictures associated with words. Distaso reiterated that Superintendent Woodard merely gave temporary directions to have students refrain from drawing religious figures until he could address the board and come back with a salient resolution. Agua Dulce resident Chris Burgard, a parent with school-aged children, made a heart-felt speech in which he said it was unreasonable, and a direct violation of every American’s First Amendment rights, to be prohibited from drawing images of Moses, Jesus, Abraham, Muhammad or other patriarchs as a result of one parent’s complaints. “If our kids wanted to draw a Christmas card with a Nativity scene on it, they would be breaking the rules,” he said. Under a strict interpretation of Islamic sharia law, images of prophets, including Muhammad, Jesus and Moses, are prohibited as a form of idolatry, which is forbidden. For Pfalzgraf, the issue is far from over.